This delightful book will engage readers of all ages. They will learn about scaly tails, spraying tails, balancing tails, stinging tails, and nine other types. The book is divided into sections based on the type. Colorful photographs of adorable animals in their natural habitats and interesting descriptions about each type of animal and its tail are found in each section. Some pages include fun experiments (like walking around with a stuffed animal on your back), while other pages include text boxes with added bits of information. Parents will enjoy reading this book to their children, and early childhood educators and librarians will find the book very useful as a resource. There is a comprehensive index that will be handy as a quick reference for teachers and librarians as well as a short glossary with wonderful words like prehensile. An added bonus in the book is a section called “Tail Talk,” where children and adults can learn what an animal is trying to tell them. This is one in a series of animal books by Beth Fielding. 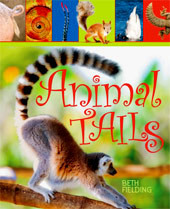 If you like her writing style, you may want to check out Animal Eyes, Animal Tongues, Animal Baths, and Animal Colors. “How much time have you spent looking at animal tails?” this book asks. If the answer is not much, you’re in for a treat. Fielding looks at lots of different tails and what they can do. Covering such topics as spraying, balancing, and warning tails, this title is divided by different animals, including elephants, chameleons, snakes, and birds. Each section features several paragraphs of text—as well as lively color photographs and sidebars—and introduces numerous species. The chapter on cat tails, for instance, focuses on the cheetah, but the house cat gets its due, too, in text that explains that unlike with dogs, a cat’s twitching tale doesn’t always mean happiness. A final section, “Tail Talk,” fits in facts about a few more animals, including goldfish, rats, seahorses, scorpions, and even bacteria. The organization seems rather arbitrary, and there may not be enough information here for reports, but browsers will have fun looking through the pages and learn something along the way.